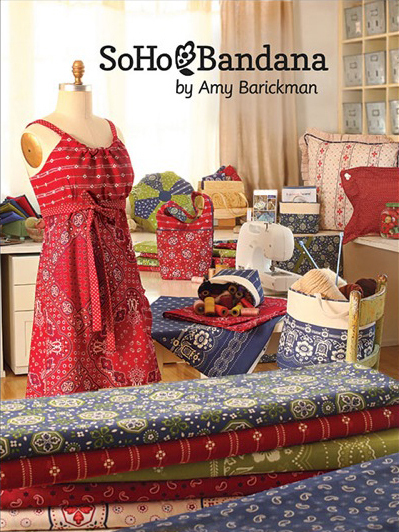 SoHo Bandana is the newest fabric line from designer Amy Barickman. An avid vintage bandana collector, Amy was inspired by those classic prints, but wanted to update them for a contemporary audience. What emerged is a fun, modern take on a print that we all know and love! When I think of bandana print, images of classic Americana spring to mind. Farmers, picnics, Kennedys, that sort of thing. Which is great, but not necessarily something I would use for me. 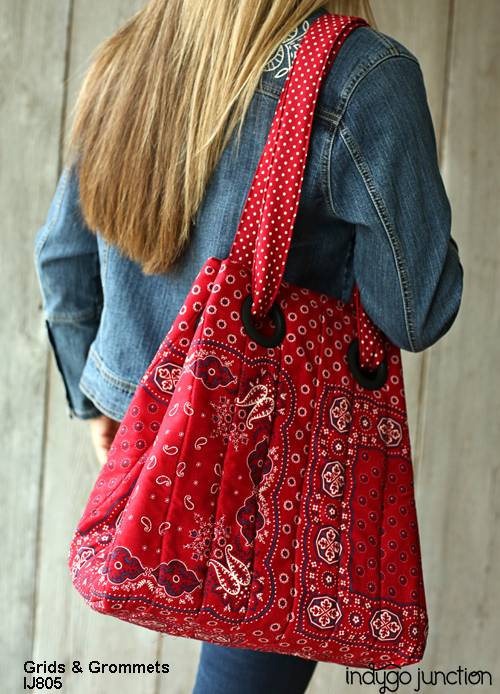 What I love about the SoHo Bandana collection is that it evokes that Americana feel, but in a way that is right for my style. I’m head over heels for that border print! One of my favorite things to sew is skirts, and I love to use border fabrics (which are so hard to find!). I have an idea to use the navy border print in a full 50’s style skirt and embroidering around the bottom. But I also want to use it for some pillows I have in mind, and the new Banded Baskets pattern (above). Would it be weird to have an outfit to match your home decor accessories? Nah! I love the classic bandana print in the kitchen. The green really pops, and would look great with some crisp, white plates. 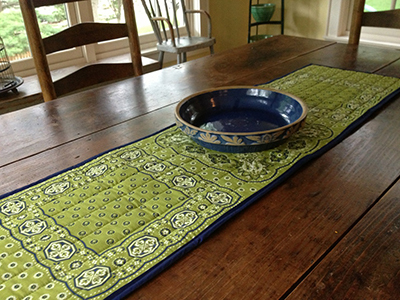 This table runner would be a quick and easy project to make. Start with a pre-cut stabilizer table runner (this one is 20 x 50), cut out your fabric to match the dimensions, and quilt it any way you please. This example has simple straight line quilting, but this would be a great time to experiment with a crazy quilt stitch. Then, simply finish the edges with bias tape. And for the piece de’ resistance? A bandana Casserole Carry-All! Spoiler alert to my friends and relatives, I have a pile of these started, so there is a good chance you will be getting one this Christmas. Then, we can have a potluck party! And it’s great for garments. (Here it’s combined with Amy’s other new fabric line, Crossroads Denim). Guess what! You can win some SoHo Bandana fabric for yourself — to enter for a chance to win, leave a comment below about your favorite bandana print and what you would use it for. A winner will be selected Monday, September 30, at 11:59 pm (East coast time). Oh, I nearly forgot to tell you about the BIG GIVEAWAY! In honor of National Sewing Month, Indygo Junction has partnered with 15 of our favorite sewing vendors (including BERNINA!) for a grand prize giveaway. You could win fabric, notions, a thread caddy cabinet, books, patterns and even a sewing machine! To enter to win, follow this link to the SoHo Bandana Contest page: http://www.indygojunction.com/blog/customer-service/national-sewing-month-giveaway-soho-blog-tour. Great fabric! I love the green border print. I think I would make an apron with it. I love the red patterns and would use it for some rag quilt letters I’m making my nephew. 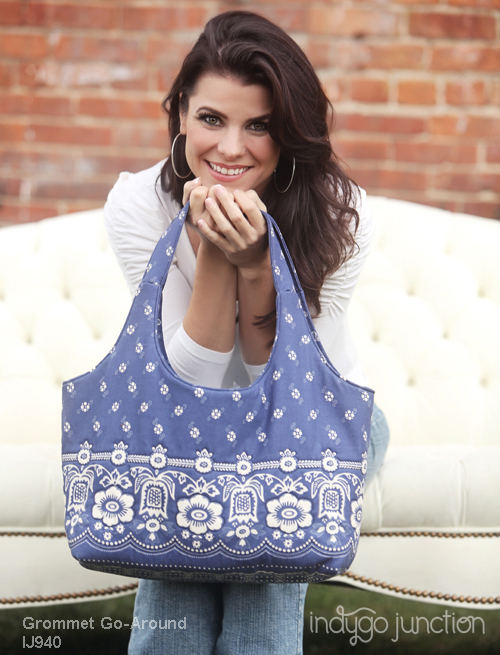 I love the blue fabric – and the bag patterns! 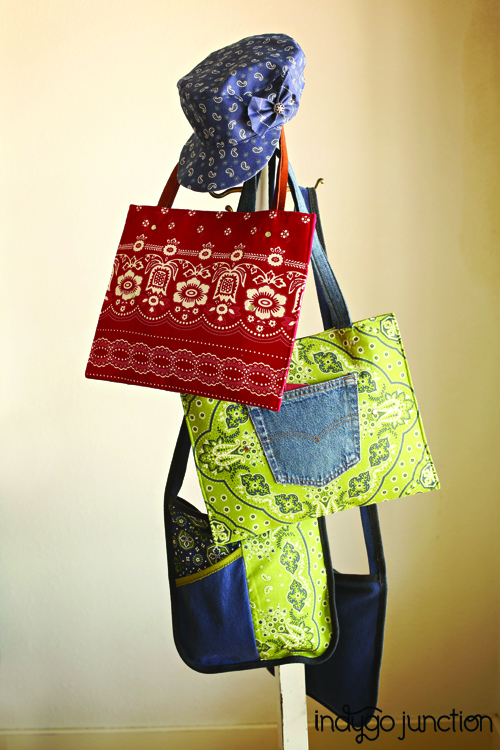 I really love the border prints and the banded bags project looks yummy. The quick-tie topper in Red is my pick! Love the fabric, love the pattern! I want to make a bag in the green! For my daughter to carry her little dog. I absolutely fell in love with the banded basket print. My wonderful husband is helping me clear out a space on our back porch to help me create my own “adult treehouse” so that I can sew in that space. That design in my favorite color of blue is speaking to me. It tells me that it wants to grace the windows in a uniquely designed window treatment. The blue border print is my favorite. Although it is very difficult to choose one thing, I would love to make the bag. 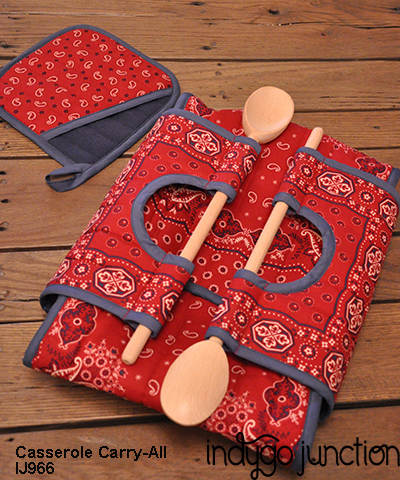 I like the reds and blues and would like to make a casserole carry-all or one of the bags. I like the green print used for the Urban Tunic. I would use it to make a bag. I love the blue border print, it would make a cute sewing bag! My favoirte color is red, so it was easy to imagine all those luscious red bandana fabrics in a red and white quilt, or could even go patriotic and add some blue for a red, white, and blue. All the items shown are gorgeous as is the whole line of fabric, great job. Thanks for the giveaway. My favorite color is red, so it was easy to imagine all those luscious red bandana fabrics in a red and white quilt, or could even go patriotic and add some blue for a red, white, and blue. All the items shown are gorgeous as is the whole line of fabric, great job. Thanks for the giveaway. Makes me want to return to garment sewing. Definitely the red patterns and I’d probably do some pillows for my nephew’s college apartment or an apron for myself. Love the patterns here though too! 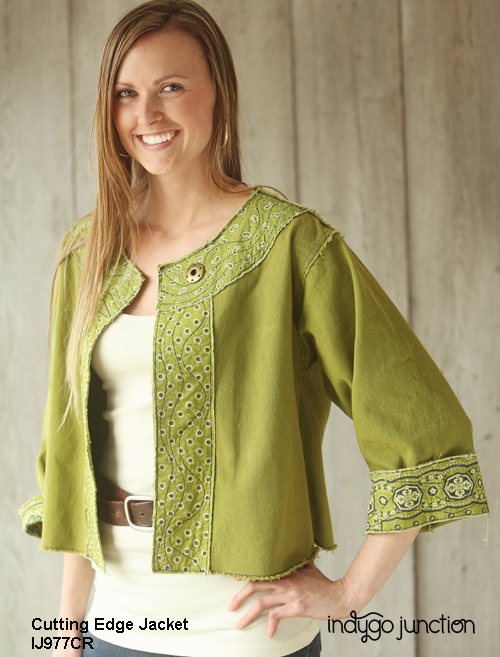 I’m loving that green and the urban tunic! Great giveaway! Thanks. 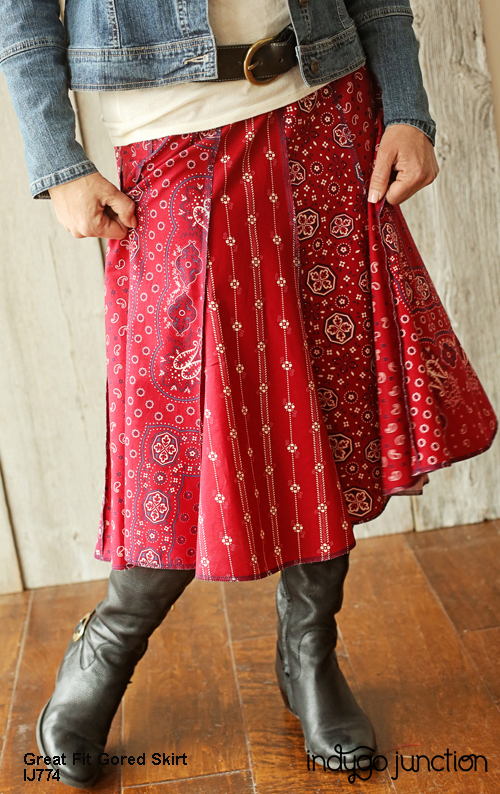 I can never resist red bandana fabric!! I would love to make a bag like the one shown with the denim straps and pocket. Love the green Quick Tie topper and the red/blue grids and Grommets purse! Just awesome! Love all the fabrics though. Think they would make great jumpers or pants and tops for the grand daughters! I really like the green and blue border print. I would make a bag and a table runner. I just wish I could make the tunic, it’s gorgeous! I like the blue print. It would make a great quilted vest to wear over jeans or a denim skirt. I like them all! More partial to red and blue, but the green is nice. Can’t decide. Do like the fact that there are other prints that coordinate with the classic bandana print. Gives you more choices than just denim. I agree that the red is really striking, but I like the blue and green combination fabric. I think I would make pillows with it. What about a nice orange bandana print. I think if the orange is tempered a little it would be a very usable color option. I absolutely love the blue border print! I would like to use this to make a cute swirl skirt. And the grommet go round bag to match! I like the red dress in the top photo with the coordinating prints. I love the blue border…I’ve been looking for a fun border print for a dress pattern I’ve been dying to try! It’s perfect! I love the red and the green colors, I would make some of the bags with it and table runners, I would probably also use some of the border prints for an apron. Like all the prints and colors but the blue would be my favorite especially the border print! A bag would be great out of this fabric but then the ideas are endless!!!!!!!!!! I love the green colors! That Grommet Go-round bag would be fun to try in it! I CAN’T STAND IT!!! The colors are all so beautiful. But if I had to choose, it would be the green for a kimono.